My friend Graham Ballantyne shot this photo of me at the farmers market. It was rainy and grey and not terribly nice farmers market weather. 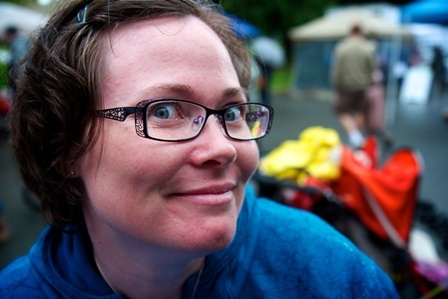 I like this photo of me because I am hamming up a silly expression, and finding joy despite the craptacular weather. I also really like this photo as a photo – the lighting is good, I like the bright colours behind me, and I like the framing. I use this as my official market headshot, and I’ve used it in many places because it really captures my normal silly expression. Thanks, Graham. Thanks Tracey! I really liked this prompt. You’re welcome! I like it myself as well.